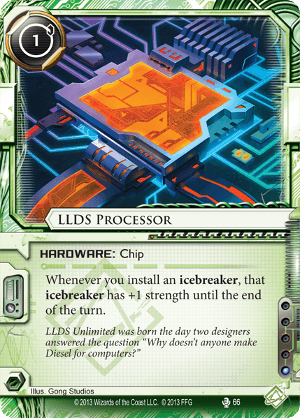 LLDS Unlimited was born the day two designers answered the question "Why doesn't anyone make Diesel for computers?" OK, now everyone is talking about this card in relation to the weapons suite, or breaking and entering suite - whatever the hell you want to call them - These three cards. A lot of people seem to be convinced that this is the combo to make all combos. And sure, it's a thing. But it's not a big thing. The trick with the weapons is to just have such a critical mass that you have the strength anyway - then be able to bust through when the time is ripe. This card is just a deck slot you don't need to use. You might as well slot in either more money, more ways to get your weapons out, or more tutors / recursion. It's only 3 influence for a full set - but how often are you going to see all three - and you're only going to be installing & using a weapon breaker on the same turn pretty rarely. Sure that might be crucial, but often you can achieve the same thing with a well placed Inside Job / Emergency Shutdown / whatever other tech tools you have in Criminal. In summary, I'm not convinced it's worth both 3 deck slots (which are mega tight already because of the weapon breakers) and 3 influence. I feel like Chameleon is a far better combo with LLDS. The whole Hayley / London Library / Autoscripter idea seems like an 'I get anywhere I please' idea. At least that's in faction. We new that the day when this card will be useful will come! Tyson Observatory + LLDS Processor is a matchmaking done properly! You can use it with Overmind , Femme Fatale or even maybe some Stealth shenanigans! Looking further into the future, this will be a staple for all Hayley Chameleon decks that will sprout! I actually like the card, it is very Shaper in nature (boosting your own tools). It will be interesting to see how this fairs with cards like Chameleon, the trash breakers and London Library. Also most likely rather useful for some Scavenge shenanigans paired with the harder to pump or restricted Icebreakers. You're about to see a lot more of this card. Which is to say you might actually see it played. The Underway contains Geist and Shiv, which completes the home invasion suite. These cards synergize so well with LLDS Processor it's crazy. Being able to toss a breaker down and get one, two, or even three extra strength is bonkers, they're only one influence apiece, and they're cheap. Clone Chip means you can do this ridiculous crap whenever you want. Prepare to pour an entire can of Diesel into your rig.